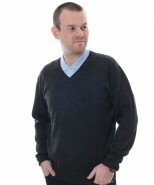 Men’s baby alpaca v neck jumper, style Marcus. Beautifully soft baby alpaca jumper in a classic v neck style perfect for everyday wear in a versatile colour. Fine ribbed cuffs, neck line and hem. Alpaca is one of the finest fibres in the World sumptuously soft yet extremely durable and lightweight yet warm For people sensitive to sheep wool rest assured alpaca fibre doesn’t irritate the wearer as it is hypoallergenic.